Whatever happened to you and me ? Remember when we were heroes ? "Hey, man, you don't talk to the Colonel. You listen to him. The man's enlarged my mind. He's a poet-warrior in the classic sense. I mean, sometimes he'll, uh, well, you'll say "Hello" to him, right ? And he'll just walk right by you, and he won't even notice you. And suddenly he'll grab you, and he'll throw you in a corner, and he'll say, "Do you know that 'if' is the middle word in life ? 'If you can keep your head when all about you are losing theirs and blaming it on you, if you can trust yourself when all men doubt you'..." - I mean, I'm no, I can't - I'm a little man, I'm a little man, he's, he's a great man. I should have been a pair of ragged claws, scuttling across floors of silent seas..."
Page 38 of The Stone Roses And The Resurrection of British Pop: The Reunion Edition by John Robb describes a focal point for Ian and John, between Sale and Altrincham. In the fields near where they lived was a river and small nondescript bridge; could this be the "fields by the reservoir" of I Miss You ? 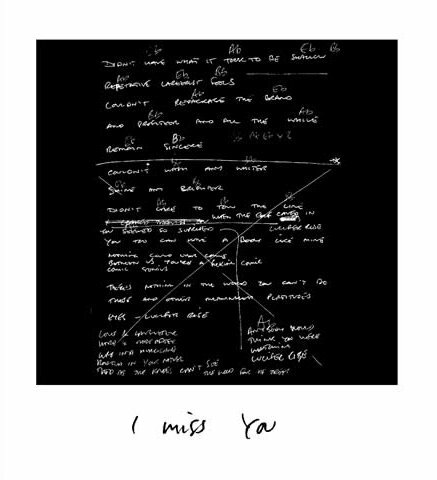 'I Miss You', a photograph by John Squire which features in the debut LP collage.